Do you know the ‘Bollandists’? Did you know that one of the earliest learned societies in the world was founded by a Jesuit? Since Fr. Jean Bolland, SJ, launched the publication of the great collection Acta Sanctorum (“Acts of the Saints”) in Antwerp (Belgium) in 1643, there has been up to now a team of highly qualified Jesuits, the Bollandists, dedicated to continuing his work in the field he had created: “critical hagiography”, or the historical critical study of the saints, their life, their cult. Saints are central in Christianity. They ensure, at every generation, that the message of the Gospel is received and announced in an ever changing society. With no saints to fully commit their life to Christ’s Good News, the Church would risk to become a mere institution. Despite the fame attached to their publications, the Bollandists have usually cultivated modesty. Today they are forced to depart from their usual discretion because their future is endangered. Since its inception, the Société des Bollandistes has been supported by the Belgian Provinces of the Society of Jesus, but the Jesuits, although willing to maintain the work, are no longer able to provide the finances necessary to sustain this great enterprise. We are therefore launching an urgent appeal to alumni of Jesuit schools around the world to help keep alive this great and historic tradition, a unique service to the universal Church. We are inviting you to help continue the mission of the Société by becoming a member of the Alumni Friends of the Société through an annual donation to support our work. IBAN: BE10 0000 0000 0404 with the reference: 182/0420/00048. 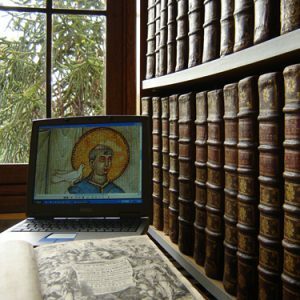 Friends will be able to receive periodic updates on the work of the Société and, subject to prior arrangement and availability, may enjoy a private visit of the Bollandist library in Brussels. We emphasize that any level of support you can provide will be welcome in helping this historical undertaking to flourish in the twenty-first century. As members of this important network of Jesuit Alumni, you may feel truly proud of this scientific enterprise.